Anyone who is an editor for long enough will accumulate a list of books they rejected which went on to success elsewhere. Sometimes you are just wrong; sometimes the book doesn’t fit; sometimes the timing is wrong. At Cambridge we used quietly to acknowledge the rejection in the late 1870s of The Philological Society’s proposal for a new comprehensive English Dictionary. This was quite possibly the right decision, at least in the short and medium term. The Syndics saved their money; the Delegates hazarded theirs — and the return was a long time coming. The Oxford English Dictionary may not have made Oxford University Press much if any money till the invention of the internet and the need for on-line dictionaries. Prestige of course is a different matter. Here’s a list from io9 of fairly famous sci-fi books which suffered rejection by publishers. These books, from io9 too, were rejected by their authors (disowned) after publication. Stephen King is on both lists. 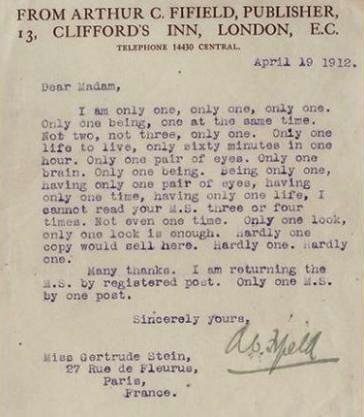 One example: a rather parodic effort by Arthur Fifield, addressed to Gertrude Stein in 1912, turning down The Making of Americans. I wonder how she took it.